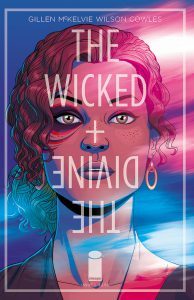 The Wicked + The Divine is the celebrated Image Comics series by Kieron Gillen and Jamie McKelvie. It is a special kind of modern fantasy in which pop stars are literally gods. Kyle Willoughby and Claire White track the historical and contemporary influences that led to this original and evocative series. Kyle takes us back to the birth of the modern super-fan in the 1950s. Claire returns us to the present with Gillen and McKelvie’s questions about mortality and the role of the artist. Our hosts end the show with their thoughts on the comic, its impressive artwork, and what they hope to see explored further.